Beautiful bride, Handsome groom.. Booze, food & bad..
..dance moves. You in or what. 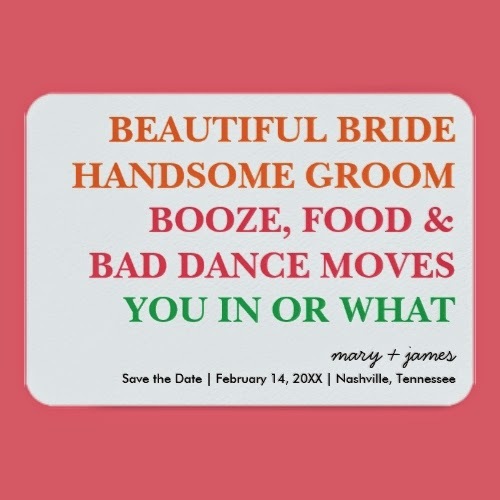 A fun, modern, fresh, trendy, completely customizable, personalized, wedding save the date invitation. The perfect invite for a wedding day filled with fun, laughter, food, drinks, celebration, partying, friends, family, happiness, beauty and bliss. A lovely, cute, funny, save the date announcement card for all your friends and family, to be a part of a special, wonderful day of your life. And a fun, cool, first invite for a bride & groom to send as a couple.